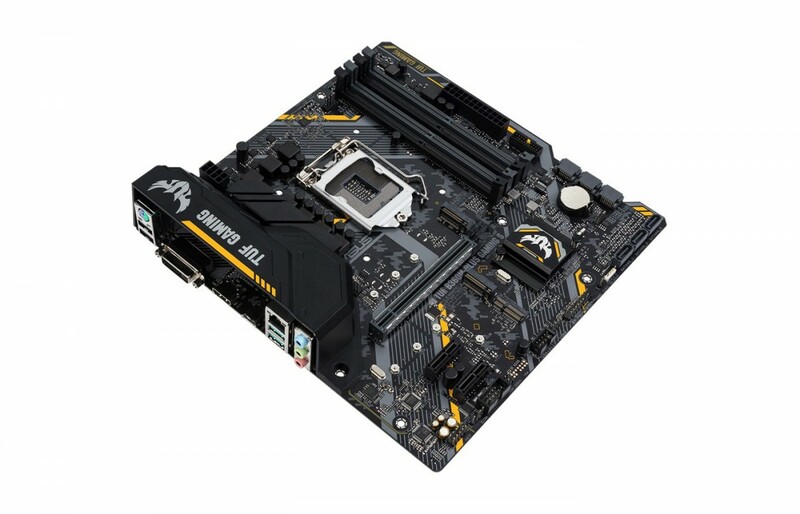 The TUF B360M-Plus Gaming S from ASUS is a mid-range motherboard that comes with a few interesting features. Compared to the Prime B360M-Plus, which ASUS unveiled a few months ago, the new model belongs to a higher-end series and packs a few more goodies. Like the name suggests, this new model is based on a micro-ATX form factor. The TUF B360M-Plus Gaming S is based on a micro-ATX form factor with four DIMM slots. There is a yellow backlight underneath the audio chip and furthermore there is steel reinforcement on the full-sized PCIe slot. In general the layout is quite simple. There are two PCIe 2.0 x1 slots and one full-sized PCIe 3.0/2.0 x16 slot. In the storage department there are six SATA ports but only three of them have been angled. Apart from that you get three M.2 slots allowing the installation of differently sized SSDs. Two M.2 slots are compatible with 2280 units, while the third one only with 2230 units. Looking at the external connectors placed directly at the I/O-panel, ASUS equipped the TUF B360M-Plus Gaming S motherboard with a P/S2 connector, two USB 3.1 Gen 1 ports, two USB 2.0 ports, one Gigabit Ethernet port as well as an analogue audio panel with optical out. Furthermore, there is one HDMI and one DVI-D port. Unfortunately there is no CMOS reset button. In terms of pricing this particular board is placed somewhere between the entry-level and mid-range market segment. In the case of the B360 we generally believe that there are some interesting boards based on this chipset. The ASUS TUF B360M-Plus Gaming S is expected to be priced around USD $120.